I wouldn’t normally get excited about watching a commercial airplane unload luggage, but how often do race cars roll down that conveyor belt into baggage claim? Next time you’re cramped into the middle seat of a 767s coach cabin, sweating and stinking and enjoying the luxuries of the jet age, you can think to yourself, “hey, there might be an Audi RS3 sitting below me.” Isn’t that something? 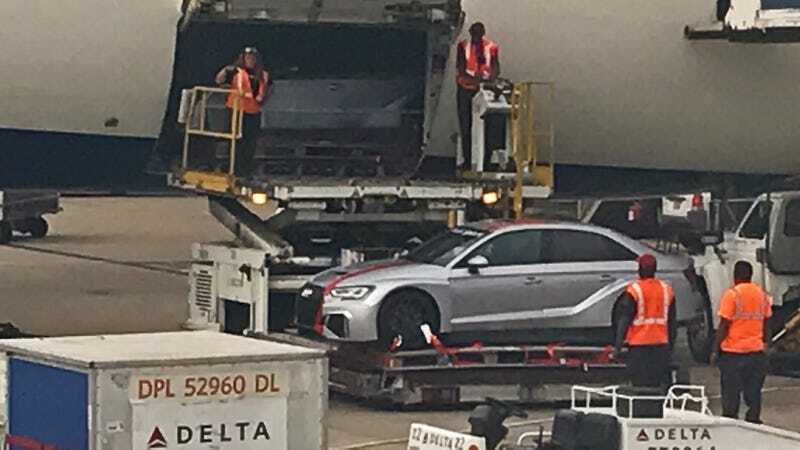 Jalopnik Reader ATSR snapped these pictures of what appear to be two RS3 LMS race cars being unloaded from a Delta jet at the Atlanta International Airport today. They look like the same cars that compete in the Touring Car Racing International Series, though they’re not decorated with any sponsorship or racing liveries. I’m not totally sure if these vehicles are heading to a track or just display duty, but the gigantic GridLife event is going down at Road Atlanta in a few weeks. Perhaps these cars will make an appearance there. I forgot how sweet the RS3 looks.